Everyone enjoys a good massage now and again. As it turns out, so does kale. I first heard about massaged kale at Cru, a restaurant in Los Angeles. The menu described the kale as “rubbed,” and having no idea what that referred to, I ordered the salad out of curiosity. Once the dish arrived, I noticed something right away: the kale was nearly a different color and texture. The soft and delicate, tender and deep dark green leaves were a far cry from the thick and rubbery, silvery-green kale I knew. Instead of eating it because I knew how good it was for me, the kale was, dare I say it? Enjoyable. I began experimenting with massaged kale at home and yielded amazing results. The stiff, bitter leaves relax into buttery-soft ribbons that keep in the fridge for days. It was a revelation, all from just a little rub-down. When kale is massaged, its cellulose structure breaks down and wilts, so the leaves that were once tough and fibrous become silky. The kale reduces in volume by over half and the leaves take on a subtle sweetness. The massage itself is simple. Once you wash and stem the kale, dress it and start rubbing the leaves together. Vigorously. Think of yourself as Sven the Swedish deep-tissue masseur and go to town on those leaves. After a couple minutes the kale should have submitted to your brutal, bone-breaking power and will have turned into delicate, dark green and tender foliage. Massaged kale obviously makes a great base for salad, but you can also add some to sandwiches, stir-fries, even pesto. 1. In a large bowl, dress kale with lemon juice and olive oil onto kale leaves and add a pinch or two of sea salt. Roll up your sleeves and massage kale until it’s deep dark green, soft, and tender, 2 to 3 minutes. 2. Add anything you like: fruits, veggies, cooked or sprouted grains and legumes, nuts and seeds. Get creative. Once you’ve massaged your kale, store it in a tightly sealed container for up to 4 days in the fridge. Whisk all ingredients together. Store leftovers in a glass jar for up to one week. Sarah – Amazing Dish , I love all dishes . Thanks for Sharing . Oh how I just love kale. It is growing in abundance at the moment in Ireland and I have been filling myself with the stuff, cannot get enough. I have never had grapes with kale before, will try this out. Nothing like a good massage! Hey Sarah. I’m out of poppy seeds. Any suggestions for a substitute so I don’t have to run out and get some? Or will this dressing be ok without poppy seeds? Thanks. ,That’s a good post.thanks for sharing. Amazing…my 3 year old grandson, LOVED this! i have a new way to eat kale every chance i get. Thanks. Hi Sarah – I just wanted to drop you a line to let you know how popular your massaged kale salad has become in my wee corner of the world. I live in Sydney. My partner thinks your salad is like having desert with dinner, it tastes so good. My Mum makes it from kale picked fresh from the garden in NZ. And, my local organic grocer, who only stocks kale at my request, now has your recipe on show so that customers can see how easy it is to make a fab’ meal with kale. Toronto Massage Therapy at VOS Massage Therapy perform high quality massage therapy treatments custom designed for your needs. Relaxation. Seriously though, I must give this idea a try. I made this last week for me, my boyfriend and my father. It is hands down one of the best salads I have EVER eaten, and I basically eat salad every day. My father and boyfriend agreed and my father was a professional chef. I’m definitely making it for thanksgiving. THANK YOU SARAH!! You are such an amazing cook, thank you for sharing your awesome ideas. who knew kale could be so sensual, that photo! ahhha great blog for the new comments like that..
My “refuses to eat kale” husband had seconds of this salad tonight even after he was told it was kale. Finally kale he will eat! Thank you! Thanks for the tip – love my kale and will love it more now!! No grapes or pine nuts, so we used apple and walnuts — yum! Thanks. I made this salad tonight and it is fantastic! I have also recently made your Fatoush with Za’atar and Minty Black Bean salads – all three have been really delicious. I hope you will release a cookbook soon – not only for my kitchen but because I am sure it would be a great gift. Thanks for the great recipes and tips. really interesting since it’s exactly Kales’ tough texture I find annoying to eat. I’ll give him a massage and see how he relaxes. Maybe not Toni Braxton though; Erika Badu fit? Toni Braxton, brilliant! 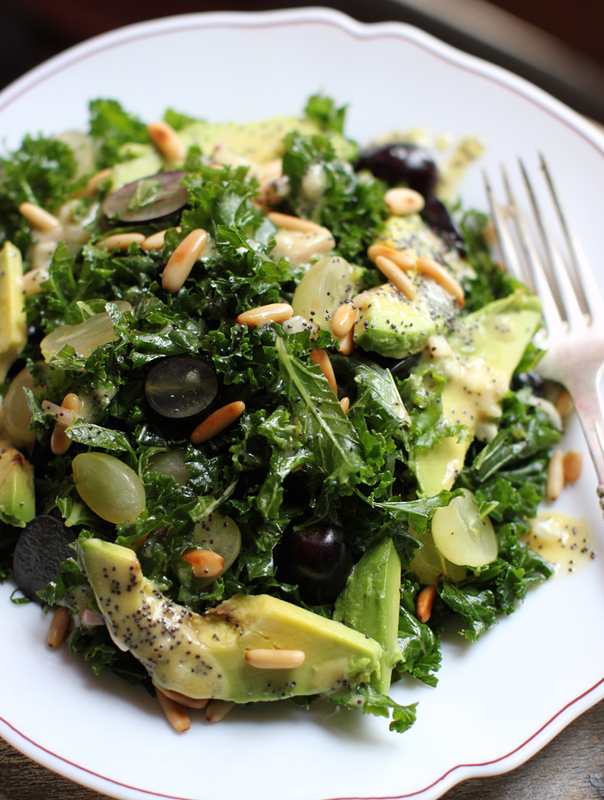 Salad looks so delicious, I miss kale living in Sweden…. This looks delicious, but now I feel such a selfish salad maker. I’ve never massaged my kale. Sarah- I laughed out loud and had to comment to thank you!! I know I’ll be snickering away all night envisioning candle lit hot leaf and leaf action, Toni Braxton in the background…. what a great/hilarious image. pure awesome. oh- and the salad looks super yummy too. Thanks! !